Electronic structure and surface properties of GaN film grown on r/a-plane sapphire. Downward band bending (0.5 eV) and high surface oxide is observed for GaN/a-sapphire. Electron affinity and ionization energy is found to be higher for GaN/a-sapphire. The electronic structure and surface properties of epitaxial GaN films grown on r- and a-plane sapphire substrates were probed via spectroscopic and microscopic measurements. X-ray photoemission spectroscopic (XPS) measurements were performed to analyse the surface chemistry, band bending and valence band hybridization states. It was observed that GaN/a-sapphire display a downward band bending of 0.5 eV and possess higher amount of surface oxide compared to GaN/r-sapphire. The valence band (VB) investigation revealed that the hybridization corresponds to the interactions of Ga 4s and Ga 4p orbitals with N 2p orbital, and result in N2p–Ga4p, N2p–Ga4s∗, mixed and N2p–Ga4s states. The energy band structure and electronic properties were measured via ultraviolet photoemission spectroscopic (UPS) experiments. The band structure analysis and electronic properties calculations divulged that the electron affinity and ionization energy of GaN/a-sapphire were 0.3 eV higher than GaN/r-sapphire film. Atomic Force Microscopic (AFM) measurements revealed faceted morphology of GaN/r-sapphire while a smooth pitted surface was observed for GaN/a-sapphire film, which is closely related to surface oxide coverage. 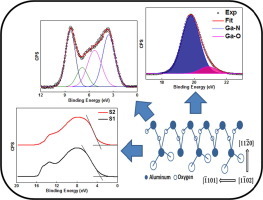 Substrate orientation induced changes in surface chemistry, band bending, hybridization states, electronic properties and surface morphology of epitaxially grown GaN were investigated via photoemission spectroscopic and Atomic Force Microscopic measurements.